Over the past few months I’ve been slowly redecorating our room. Ever since we moved into the house (2 years ago) it honestly never really got finished. The kid’s rooms always took priority. We did paint it in a mad dash before Finley was born but that was about it. I love our room. It has vaulted ceilings, lots of space and pretty morning light. I love the idea of your bedroom feeling like a little retreat. Anyway, i’ve been buying a few items here and there to create a more finished feel. Mostly plants. I’ve wanted to keep everything bright and light feeling. Lots of white and neutrals. Our bed was feeling a little sterile though. 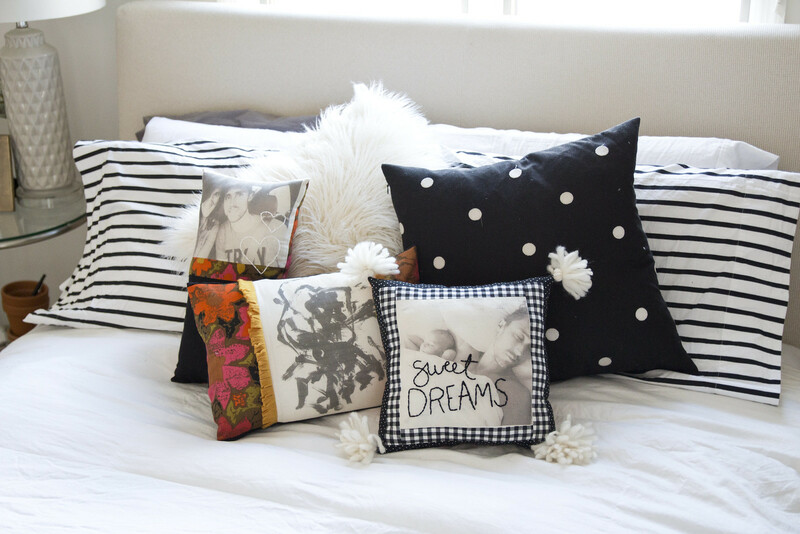 That’s when I came up with the idea of creating some fun accent pillows for the bed with some cute personal touches. 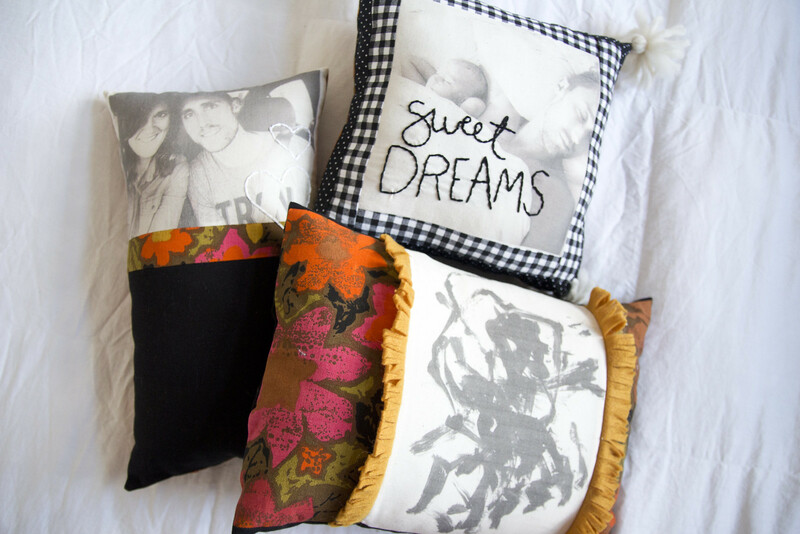 I teamed up with Canon USA to make these pillows come to life! I was planning on just printing onto some transfer paper BUT did you know you can print right onto fabric from your printer?? How cool and convenient is that?! All you need is freezer paper. I was totally jumping up and down when it worked. 1. 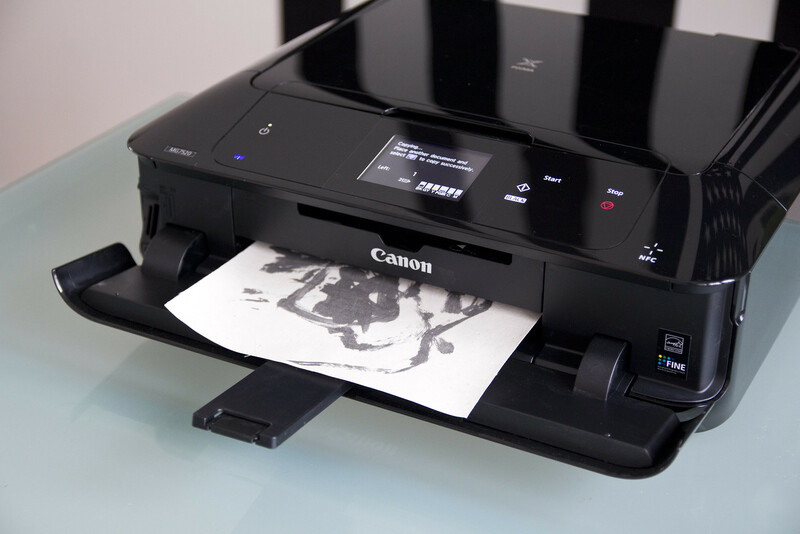 Cut a piece of freezer paper to 8.5×11″ (or whatever size your printer prints). 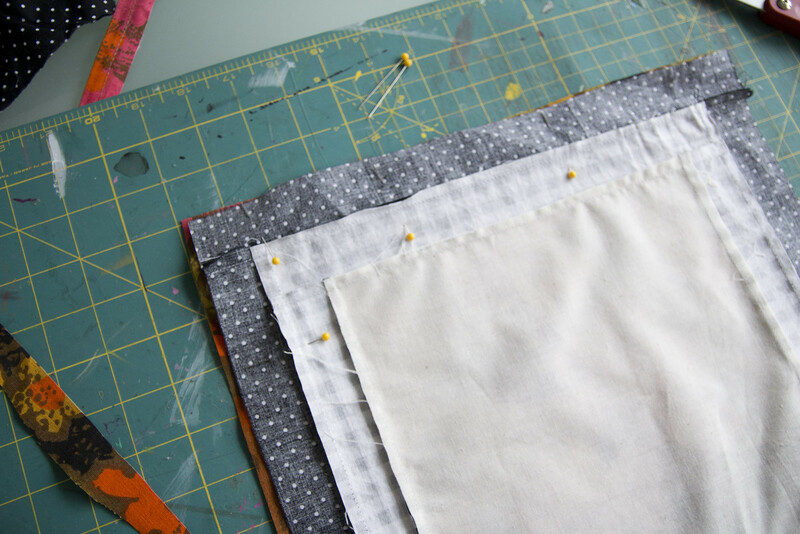 Iron the freezer paper to a piece of muslin that is slightly bigger than 8.5×11″. That way you can trim it exactly to the size of the freezer paper after you iron it. You want the edges to be lined up perfect so that it will feed through the printer right. The freezer paper gives the fabric some “weight” to be pulled through the printer. 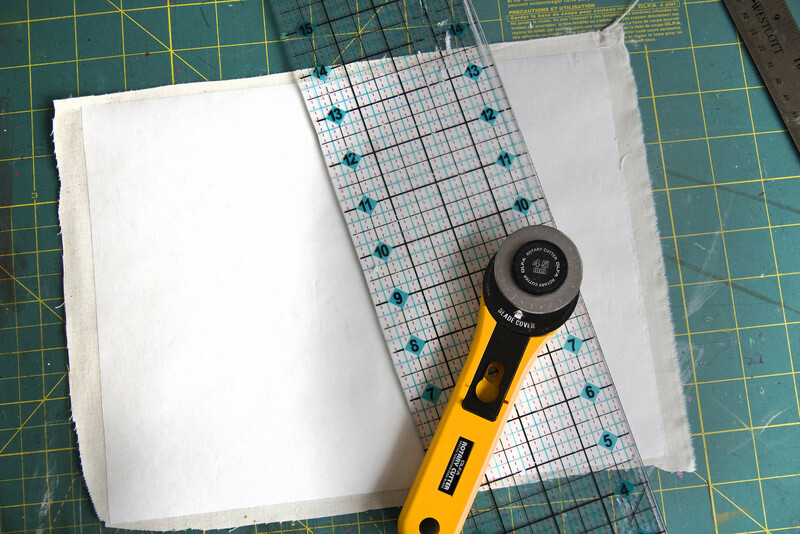 Make as many fabric/freezer paper sheets as you want photos printed. I ended up making 3 – 8.5×11″ sheets to use in the printer. 2. 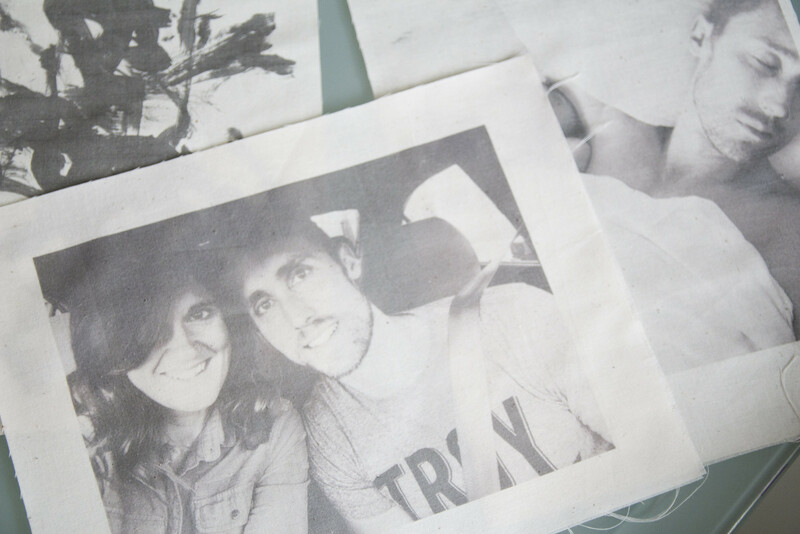 With our PIXMA MG7520 printer I was able to print the photos right on the muslin/freezer paper sheets I created. 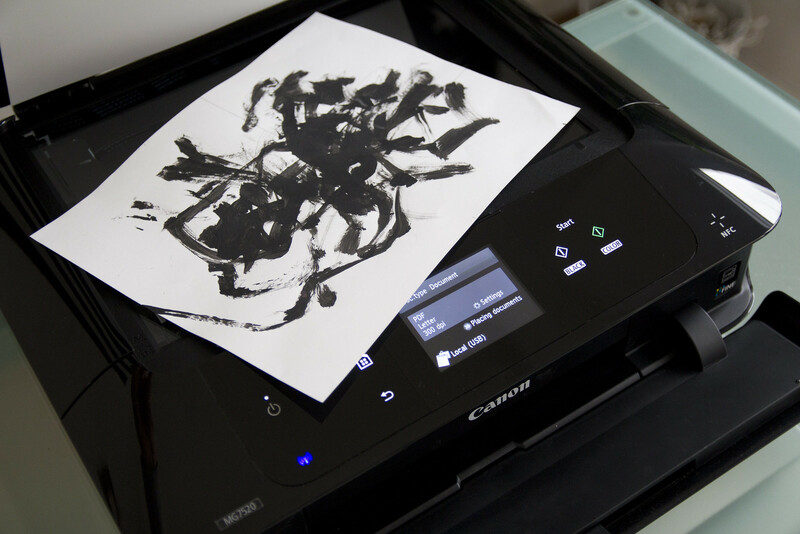 I printed 2 b&w photos and then I even scanned a piece of Rowan’s artwork using the scanner on the printer. It made the coolest pattern fabric when it printed. 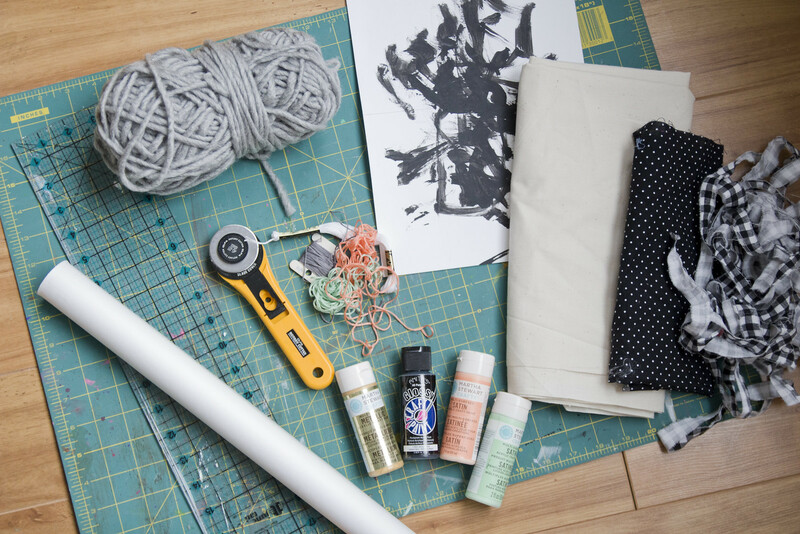 Make sure you load your fabric paper the right way. 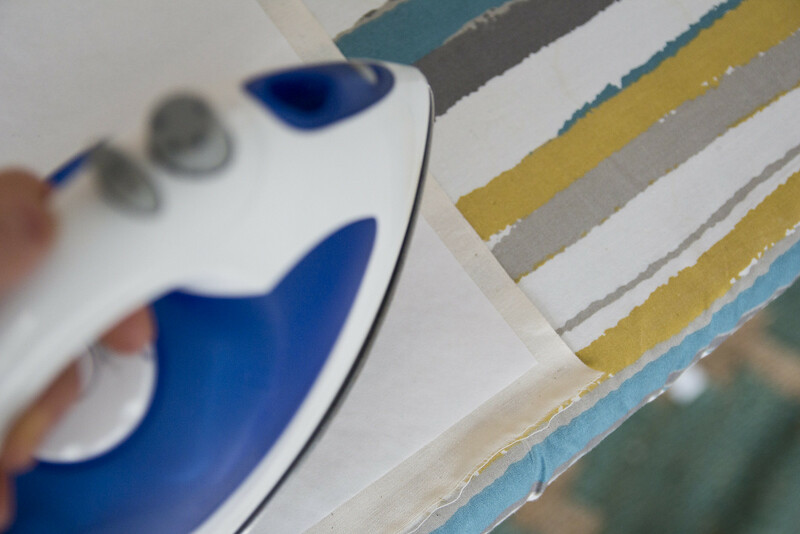 You want to make sure the photos print on the fabric side NOT the freezer paper side. 3. 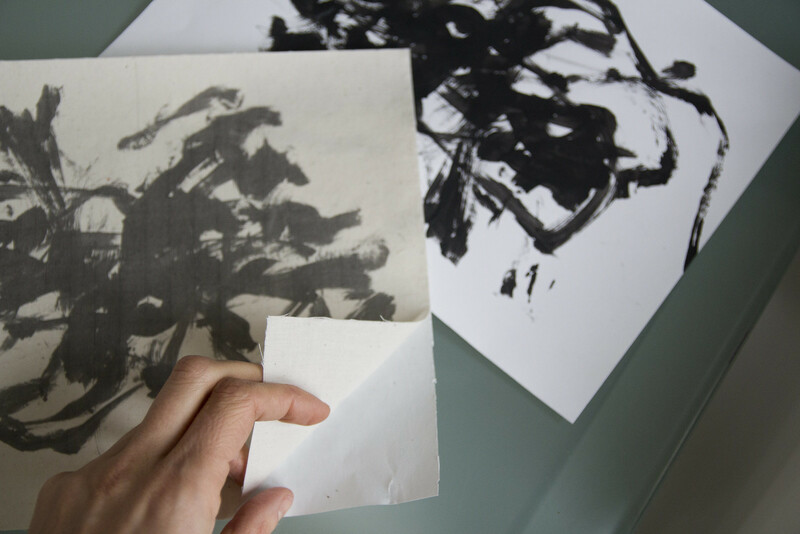 When everything is printed, peel off the freezer paper back and discard. You will now be left with the printed fabric. The world is your oyster! I’m going to make pillows with mine. How cute would little patches for your kids jeans be? 4. Here comes the extra fun part! 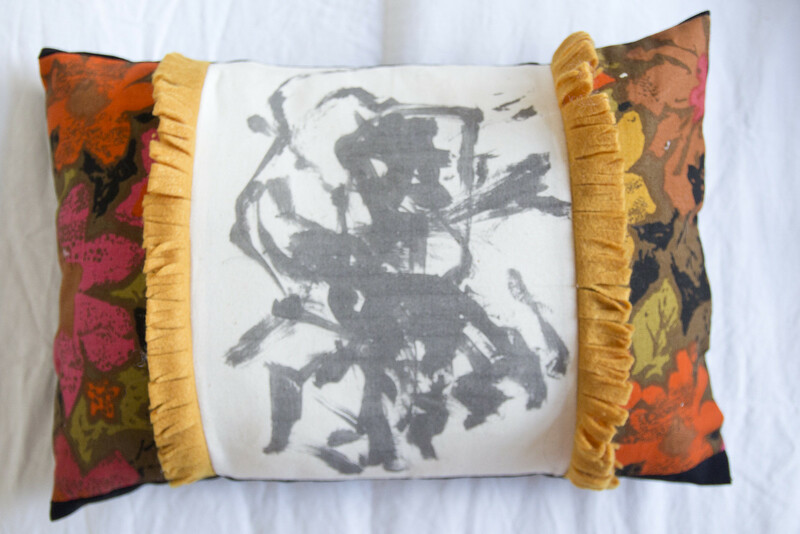 Since I wanted pillows bigger than 8.5×11″ I was able to get creative and think of some fun ways to design the pillows. 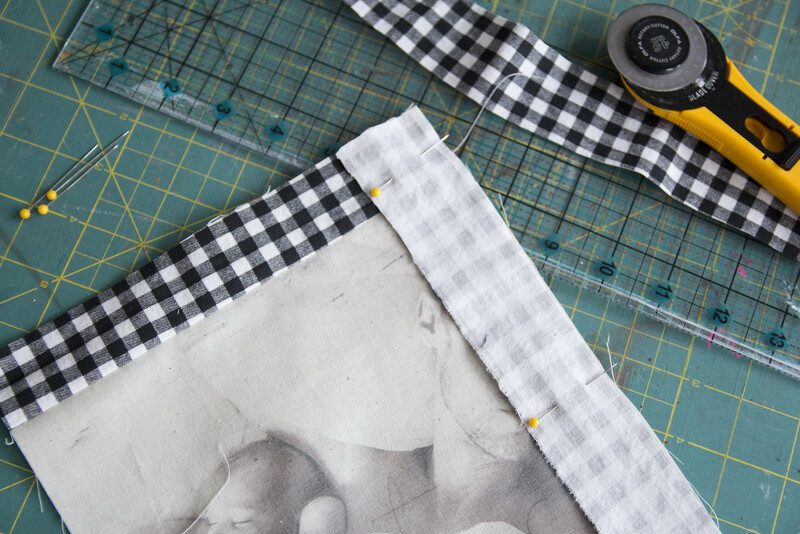 For the first one I cut 1.5″ strips of fabric to sew around the square picture. 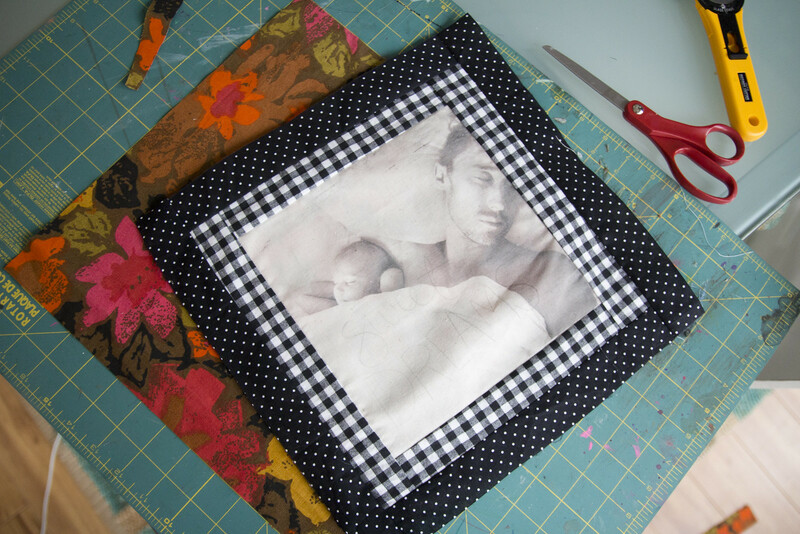 I sewed the checkered strips first, then added the polka dot fabric creating 2 borders to enlarge the front of the pillow. You will also need to cut out a backside piece of fabric for the pillow. 5. Before you sew the pillow together add any embroidery/details (buttons, paint, etc…) that you want to the pillow. 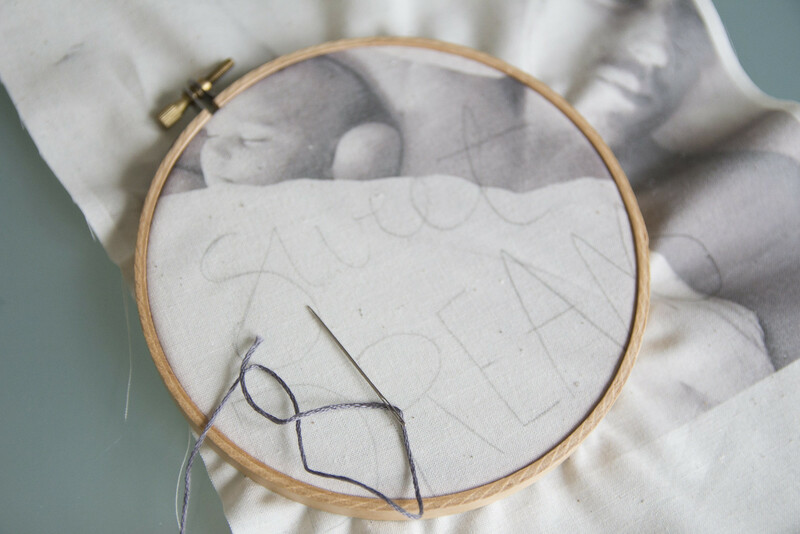 I decided to stitch the words “sweet dreams” onto the front. After you finish, pin right sides together and sew the edges of your pillow together. Leaving a small opening at the bottom to turn and stuff. 6. To finish it off I added some tassels to the corners of my pillow and then stuffed it full of batting. Hand sew the opening closed at the bottom when you’re done. 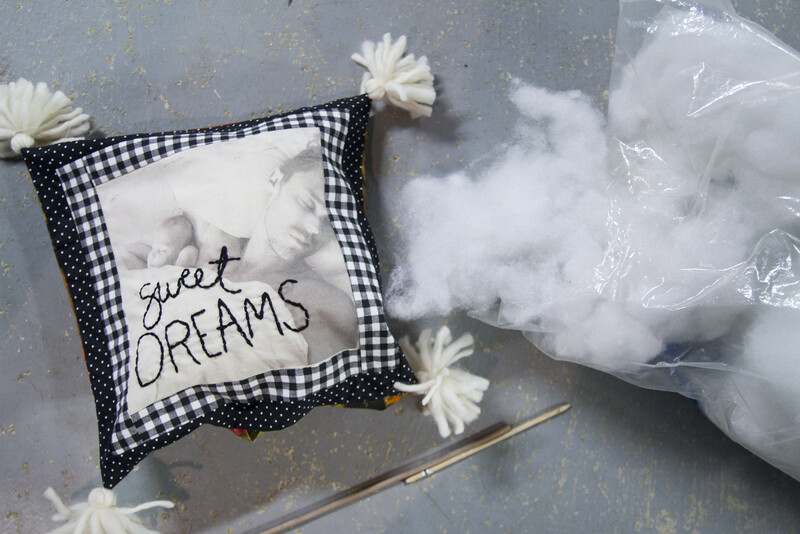 You can really have a lot of fun coming up with your own pillow ideas. The possibilities are endless!! Can you share where you got that calendar? The graphic but minimal design is awesome! What an awesome idea! 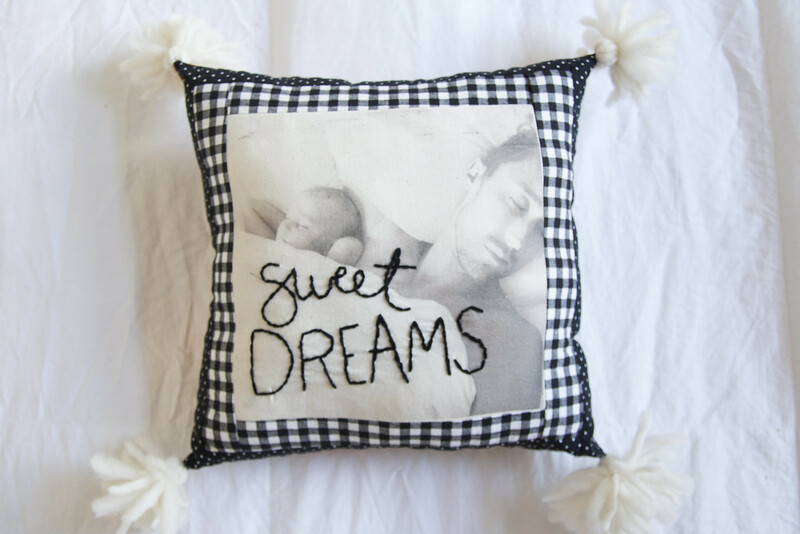 I love the sweet dreams embroidery :)) You’re so creative! this is such a great idea and the results are great! 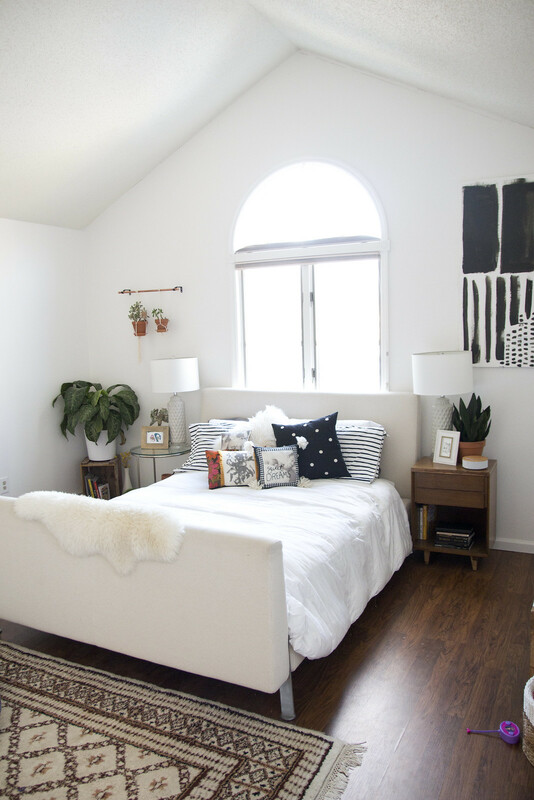 Your room looks so bright and fresh! Love it! Where did you get that huge calendar? Just discovered your page researching TeePees! I want to make one for my little boy, fingers crossed it looks as good as yours! And I love these cushions! 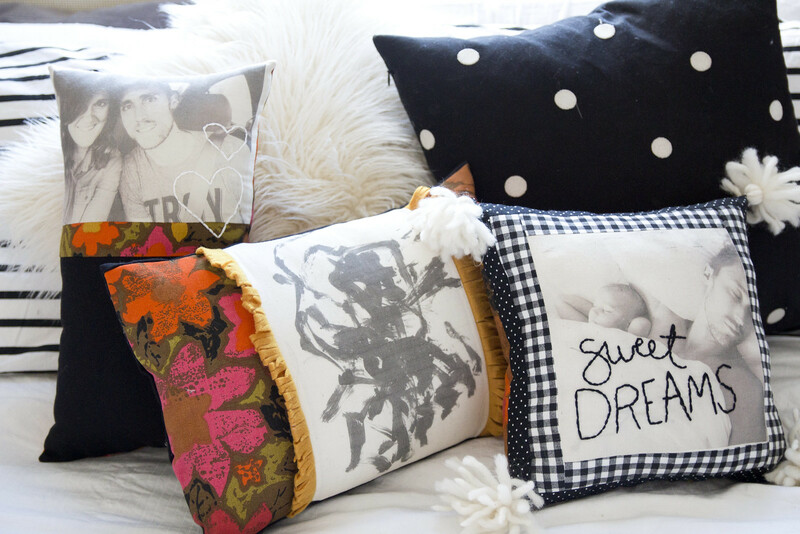 love your pillows. i have been looking for striped pillow cases can i ask where you found the ones on your bed!? thanks! Unrelated to the post, but where did you get the striped sheets on your bed. I’ve been looking for ones like that! Hi there! 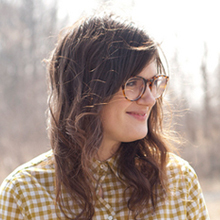 My name is Heather, I keep a little blog over at Joie De Vivre. I found your blog via the Love Taza Blog. I just wanted to tell you how much I enjoy reading it! And this pillow project is fantastic!!!! I have totally got a great a idea now for a valentines day gift for my hubby so thanks! jen – i love the rug at the end of your bed. where did you get that from? thanks so much.